By failing to initially cover a story millions of people nevertheless learned of -- the presidential gaffe noted at NewsBusters by Matt Sheffield, among others, on Thursday morning -- the Associated Press created a bit of a problem for itself. In a speech to soldiers at Fort Drum, President Obama "mistakenly identified a fallen member of that division as another soldier in a completely different Army unit who is alive" -- both of whom were awarded the Congressional Medal of Honor. NB's Geoffrey Dickens noted later on Thursday that the Big 3 television networks also ignored the story. The dictionary's primary definition of "confirm" is "to establish the truth, accuracy, validity, or genuineness of." You see, in the Orwellian world of the Associated Press, we don't know that the President's gaffe really occurred because the self-described "Essential Global News Network" didn't report it. Therefore, it can only turn into something that really did occur when a White House spokesperson "confirms" that it occurred. Until then, in AP-Land, it's only some kind of unverifiable rumor. Never mind that it's recorded here at YouTube and heaven knows how many other places. Never mind that it was noted Wednesday by over 50 blogs, including several high-traffic leaders like Pajamas Media (here and here), Hot Air, Gateway Pundit, Blackfive, and Wizbang. Never mind that Andrew Breitbart posted the related video at 3:59 p.m. on Wednesday. Never mind that a few establishment press outlets noted the gaffe early on Thursday, though with a level of understanding which would never have been and almost never has been allotted to a conservative or Republican, including the LA Times ("Obama confuses his Medal of Honor recipients during Ft. Drum remarks"), the Washington Post ("Obama slips on names of Medal of Honor recipients"), CBS News ("Obama criticized for flubbing name of medal of honor recipient" -- Of course, the gaffe isn't the story, it's the fact that meanie conservatives are pointing it out), and ABC News ("Obama Flubs Medal Of Honor Winner"). First time I saw 10th Mountain Division, you guys were in southern Iraq. When I went back to visit Afghanistan, you guys were the first ones there. I had the great honor of seeing some of you because a comrade of yours, Jared Monti, was the first person who I was able to award the Medal of Honor to who actually came back and wasn’t receiving it posthumously. The White House is confirming that President Barack Obama misspoke about a Medal of Honor winner coming home alive during comments at Fort Drum in upstate New York. Addressing soldiers of the 10th Mountain Division on Thursday, Obama said one of their comrades was the first person he had awarded the Medal of Honor who wasn't receiving it posthumously. In fact, the soldier, Sgt. 1st Class Jared Monti, was killed in action. Obama spokesman Josh Earnest says the president misspoke. He noted that Obama paid tribute to Monti in remarks to troops in Afghanistan in March 2010. But Salvatore Giunta was the first living recipient of the medal among veterans of the Iraq and Afghanistan wars. You would almost think that until Mr. 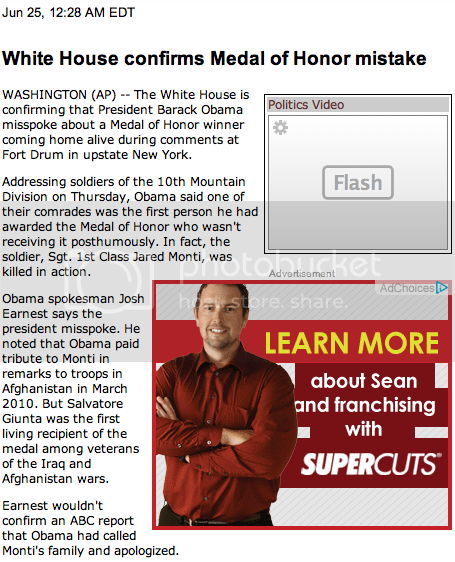 Earnest said the president "misspoke," everybody thought Obama was correct (Update: ... and that, as NewsBusters commenter MotherBelt wryly observed, everybody else was wrong about which soldier lived and which one died). Earth to AP: The correct words are "admitted" and "acknowledged." We're not in a situation where a historical event isn't considered to have happened until the White House says so -- at least not yet.